I have a big problem! Well big to me. I thought it would be a good idea to create a thread for DYI projects that anyone is working on. Whether it be crafts, furniture, redecorating, or problems that need suggestions on how to resolve them. I'll go first. I opened my fridge last night and the bulb was burnt out. Ok no big deal. I got an appliance light bulb and was going to simply change it. The bulb was hanging by a thread! I have no idea how that happened. Maybe I hit it without realizing it? IDK As soon as I touched the bulb, it fell off. I had this happen to my oven light bulb years ago. I used a potatoe method, cut a potatoe in half and shove it hard into the opening, and voila it unscrewed very easily. This time, no dice. I googled other ideas, and saw a water bottle method. Melt the top of a bottle and use it to twist the bulb out. Nope, didn't work. Now what? I've seen several different ideas, but I'm wondering what has worked for anyone else?? 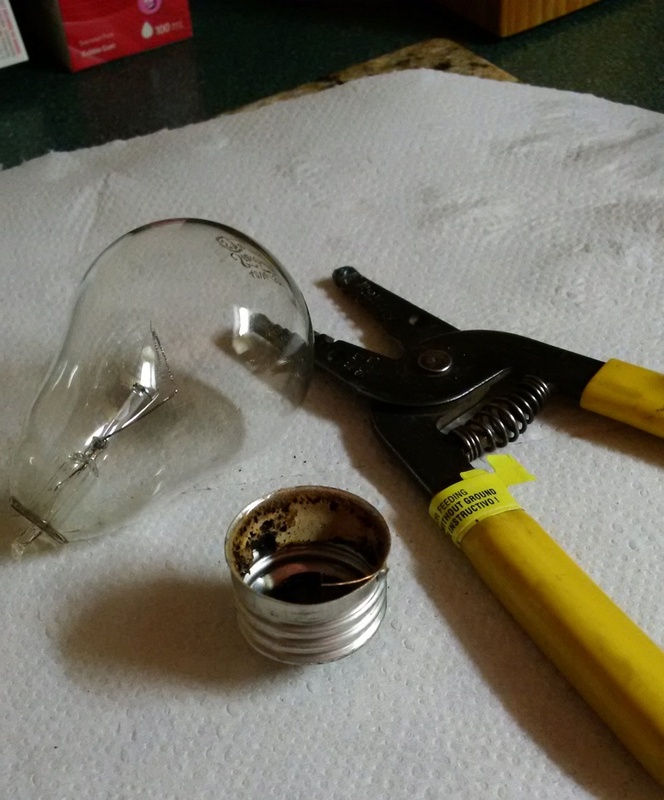 I had that problem, with a bigger bulb and my son took it out with needle nose pinchers, grabbing the metal base. Remember to turn off the power! Thanks @Junequilts I'm going to try that tonight. My picture taken with my phone. Thanks @Junequilts I found a youtube to show me your method, and it worked perfectly! Not to nitpick, but should this be titled DIY instead of DYI? I think she meant DYI--Do Yourself In. I created the thread in a moment of Thanks for the spell check @BKay! I'm trying to find something to shill so I can still work here for free and earn $$ on the side. Wait? You mean we work here for F-R-E-E? So, that's why you keep telling me my check's in the mail. GA -- Off topic -- if you need something to shill, I am sure some of the past Bachelor/ette folks could help you out. Hahaha, you two mods can start your own comedy routine blog. The new Martin and Lewis! @GuardianAngel, I'm glad you got your bulb issue fixed. This thread is a good idea! This is incredible, you’ll never have to wait for your car to heat up and defrost again! @GuardianAngel That's a great tip!